Launch of Europe's second MetOp weather observatory has been delayed, potentially until late July, by a squabble between Russia and Kazakhstan over drop zones for the lower stages of the satellite's Soyuz rocket, the European Space Agency announced Friday. The mission was preparing to lift off May 23 from the Baikonur Cosmodrome in Kazakhstan. A Soyuz 2-1a rocket and Fregat upper stage will launch the MetOp B meteorological satellite into a near-polar orbit. In order to reach MetOp B's target orbit, the three-stage Soyuz rocket must fly north from Baikonur, a unique trajectory for launches from the Kazakhstan space center. Most Russian launchers bound for polar orbits lift off from the Plesetsk Cosmodrome in northern Russia. 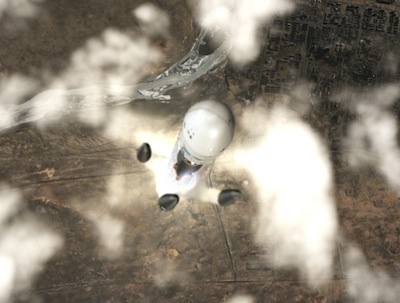 Four strap-on boosters comprising the Soyuz first stage would fall on Kazakh territory north of Baikonur. First stages from other Soyuz launchers also drop downrange on Kazakhstan, but in a different location east of Baikonur. A statement released Friday by Starsem, the French-Russian commercial Soyuz sales firm, said the launch would be delayed "by several weeks" because "additional measures are needed to ensure the drop zone availability" for the Soyuz stages. ESA officials expect the launch could be rescheduled for the second half of July, after the launch of another European weather satellite - MSG 3 - aboard an Ariane 5 rocket from the Guiana Space Center in South America. MetOp B will remain secured in a clean room facility at Baikonur ready for fueling once officials select a launch date, according to ESA. 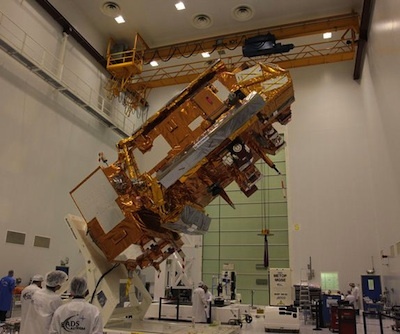 Heading for a 507-mile-high orbit, MetOp B is the second of three almost identical polar-orbiting weather satellites to provide meteorological data to European and U.S. forecasters and scientists. The launch of MetOp A in October 2006 followed the same trajectory north from Baikonur as planned for MetOp B. The MetOp weather satellite program is a joint effort between ESA and the Eumetsat, or the European Organization for the Exploitation of Meteorological Satellites. The program's three satellites, launch vehicles, ground segment and flight operations are projected to cost 2.7 billion euros, or nearly $3.6 billion, adjusted for inflation to 2011 levels. ESA paid for development of the first MetOp satellite, while Eumetsat funds launch services, ground systems, operations, and procurement of follow-on satellites through ESA.